Returning to the dig site on the last day of November, 2007, I was certainly excited to get something good after our last spell of good luck. Jim was not present, as he was out of town for a business meeting of some sort - something he had warned us of previously. Kyle was meeting me at the site shortly afterwards. Upon arrival, however, I was greeted with a not-so-pleasant sight! Someone had been digging whilst Kyle & I were away for the past few days! I rechecked my mentality that it would be better for someone to retrieve the bottles and make good use of them than no one at all, and found it still working just fine. Still, it kind of bothered me someone had been there and was taking home artifacts without us knowing about them. I set to work digging where I had dug the first day - just out and around in a big circle in the yard. Only around 6-8" deep. A few ginger beer shards, R. Taylor bases, etc, and R. Taylor and G.E.Murdock quart blob bases, galore - still glass like you wouldn't believe, though by this point, we had obviously become desensitized by mere shards from Strathroy bottles - we wanted something more! We wanted intact G.E.Murdoch pieces and R. Taylor ginger beers! Kyle showed up a couple hours after I arrived, and I showed him the digging. He shrugged it off as probably being Jim, and I realized that this probably was the case, I just hadn't thought of it. We decided to grab something to eat, as it was around lunch, and perhaps hit the library before continuing our dig. The maps at the library showed us a number of things we didn't know about. First off - the relatively small lots we were digging in were previously much larger - the full length between the road they currently faced, and the laneway which ran behind them. Someone, around the 1930s or so, had subdivided the lots, and built a house along the backs of two of them, and much later (probably the 1970s), the iconic local bar, Leo's, was built covering the entire back half of the "soda shop" lot. Who knows what was turned up then? Either way - we now knew why we were unable to find any trash pits - they probably would have been in the backs of the lots, and thus were now covered up! When we returned, with knowledge from the library of enlightenment, Kyle began digging around the back wall of the addition, towards the steps, and I continued digging where I was - also towards the back steps. 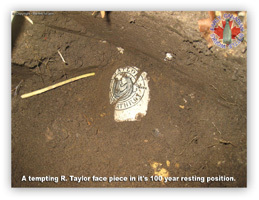 Jim showed up, again, a couple hours later, but we had nothing to show but a bunch more R. Taylor ginger beer shards. It turned out that it had been Jim digging behind the steps the day previously, and he had turned up an intact blob-top J. Tune out of London! Although it had a lip chip, and was a fairly common bottle, neither Kyle nor I had ever dug one, so when he offered it to one of us, we were excited to say the least! He mentioned that it had come from a seemingly deeper than ordinary layer, and that he thought we should try and hack into it elsewhere - see if anything came out. I tried digging deeper where I was behind the steps, but little could be found. Jim joined Kyle behind the addition, and both of them began to dig inwards, when I decided to take it upon myself to remove some more of those floor boards. Around the time Kyle & I both began digging after returning, we noticed something unusual. Parked beside my car in the Leo's parking lot next door, now vacant as the business was obviously shut down, was a large white Ford pickup, a simple trailer behind it, laden down with at least a tonne of heavy duty galvanized steel fencing - the stuff you see around construction sites. 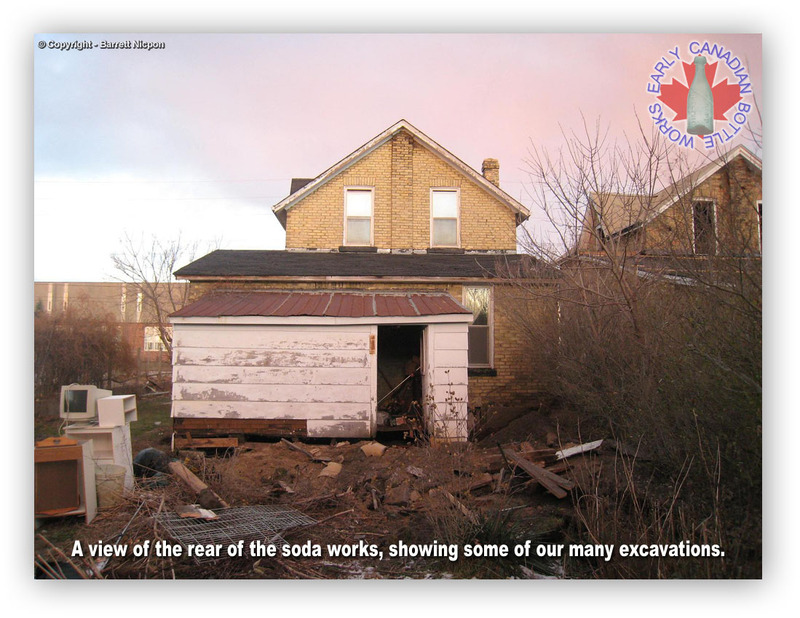 Our reality of digging a soda works for the first (and probably last time) in our lives was being threatened by the conflicting reality of the impending demolition and construction taking place within mere days. Jim, being an amiable fellow, was conversing with the fellows, and sure enough, they were slated to erect the fence to be used for the prevention of trespassing during the construction over the course of the next few weeks. As we were digging, they began to set it up! Doing my best to manoeuvre the saw in such a way as would not cause the building to collapse around (or on top of) me, I began hack away boards from that floor so Jim & Kyle could dig beneath. I managed to remove an area about 6' in from the side wall, and 5' from the back wall - plenty of room to comfortably stand and throw dirt. After Kyle & I worked on moving the concrete back step more efficiently by breaking it apart with a 12 lb sledge I had brought, Jim & I began digging where the step had been. I encountered more metal than I could possibly have reasoned with, so I decided to check out the back end of the far lot. The presence of a driveway there made finding the trash pits from that far house still plausible where the other lots were covered by the house and Leo's. Probing around in that lot, all I could find was a 1950s trash pit, and, strangely enough, a 3' deep pit with a lot of iron, broken china, and 1950s newspaper fragments! Who knows how they could have been so well preserved, but, regardless, they were unsalvageable due to the extent of decay which had occurred. The owner of the house which had been built across the backyard showed up, and gave me permission to dig all I'd like, though he claimed little could be found short of small shards (many of which he had found whilst gardening!). While talking to him about some insulators he had at home, Kyle came running up exasperated. "Jim hit into that deep pocket!" he reported, and piqued my interest thoroughly. I ran to see what Jim had turned up, and was surprised... but not too surprised. 4 large shards from an even larger yellow earthenware crock were lying atop his pile of dirt, and 3 bottles with their necks broken off were scattered about - one J. Tune, and two R. Taylor quarts. I was excited still, to see that something had come out, and from so deep none the less (Jim was digging easily 2 1/2' down), where we had previously thought there was nothing, but, again... where was the intact stuff? There had to be something without the very top knocked off in this yard! Jim asked if we had dug this deep where we had dug the amber quarts out a few days before, and, having no answer for him, I set out to find out. Kyle and Jim were both having little luck by the time I reopened the hole we had dug previously from all the tailings of our dig beneath the house. Jim had hit the edge of his deep pocket, which didn't seem to go any farther than the rear addition itself, and Kyle hadn't been able to find it where he was digging farther along the back wall, despite being at the same depth. Almost immediately after digging slightly deeper than either of us had over beside the side, I hit the neck from a bottle. Obviously broken in the same way as all the others, but again, we didn't know this was here before! 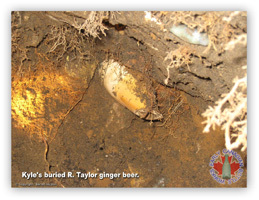 Unearthing the bottle, and in the process, a large ginger beer shard showing the “. TAYLOR / MARK” part of the ink stamp, I was vis-a-vis with a lovely R. Taylor quart, obviously a blob-top by the thick glass and sloped shoulders. 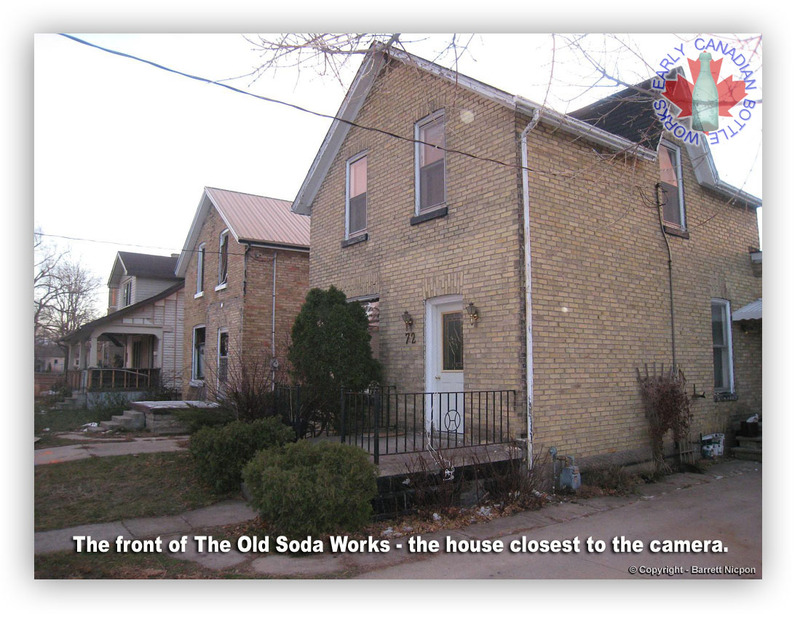 I also unearthed part of some kind of Soda Water Works quart from Sarnia, and pieces from several R. Taylor split (half pint) sodas in clear. I continued to dig sideways until I hit the cistern Kyle had uncovered previously in one direction, and some kind of septic tank or another cistern, much closer to the house, in the other. I was digging a small channel in between them, and the digging became harder and harder, as I realized that I had no place to throw my dirt. I had to rely on my arms to project the humus over 8' from my hole into the backyard where Jim & I had been digging several days before. All manner of interesting shards popped out of this layer, including a large portion of the front face of an awesome amber J. Tune quart from London, and the bottom half of a killer green/yellow green R. Taylor quart! Another base segment from yet another amber Wilson quart from Toronto, with the squirrel on it emerged, as well. All the usual stuff - several ginger beer shards, lots of those clear, straight embossed G.E. Murdoch pieces, and still quite a few more R. Taylor half pint splits. Jim reported that he had to head home for dinner shortly after I hit a series of clay drainage tiles, and was having difficulty removing them from all the shards buried around. We said our goodbyes, and agreed to meet up the next day (Sunday) for another dig, as we were obviously not done yet. As Jim departed, Kyle & I agreed to dig a tad longer - at least until it became closer to dark out. I decided to head over to the other side of the hedge along the south side of the yard, and dig in between the Soda Shop house, and the middle of the three houses, while Kyle agreed to continue in the hole I was digging. As I began to dig a test hole, good prospects greeted me! Glass, glass galore! It continued to emerge from the dark soil. In between bricks, bricks galore, of course, but none the less, the trash layer continued into the side yard! I didn't make my test hole too deep before Kyle, a serious tone in his voice, reported from behind a wall of dirt that he may have an R. Taylor almost intact. I was excited (what else is new? ), and he continued to give me a streaming report of the condition of the piece as he unearthed more of it. "It's an R. Taylor alright!" he called out in dampened form from beneath the ground. Then a series of conflicting reports regarding the condition of the piece followed, while I was still removing crown tops, quart bases, and seltzer shards from the ground. The sky was darkening severely before Kyle grabbed the camera, snapped a few photos of the piece, and suddenly emerged from the hole with an R. Taylor ginger beer with just the very top broken off - part of the lip even remained! And the transfer was immaculate! Shortly after Kyle liberated this one startling find, we decided it had simply become too dark to see where we were digging any more, and that we would call it a day. The following morning, the site would still be waiting, and having survived burial for countless other sun falls and rises, the bottles we knew were waiting would, as well. So, we did what any sensible bottle diggers on a real spree would do - went home to dream of amber quart sodas and ginger beers, toss and turn for several hours unable to sleep, and then jump out of bed in the morning eager to dig, skip the shower, choke down some breakfast, and head back to the site. All that night, I tossed and turned, unable to sleep due to my vibrant dreams of amber quart sodas and ginger beers. When the morning light finally came... I continued to sleep. My alarm, matter-of-factly, didn't go off until 8 AM, a shameful tardiness for any true digger, in such a position, to wear. When it finally did ring, I jumped out of bed, threw my digging clothes on (noting that the hole in the left knee of my jeans had increased in size dramatically), skipped the shower, and headed straight to the cafeteria in my residence to eat. I choked down the eggs, sausage, and French toast, unable to taste it properly - my mind too engrossed with thoughts of what could come out of the ground within a few hours. I made good time of the breakfast, and headed to the parking lot to clean yet another fresh layer of snow off my car. I noted the beauty and perfect symmetry of the especially light and fluffy snow, and reflected on how great it feels to know you're going digging in weather which prohibits it. Snow, equates to frozen ground, which equates to no digging for a long time... but not this day. No, this was our day... as had been the last 4. I arrived at the site, the first one there, and began digging. I had barely had a chance to remove much dirt from the hole, when I hit a small, clear base emerging from the dirt reading "R-T" in clear, bold prismatic embossing. Digging gently, and removing the piece, I was very pleased to be holding 80% of an R. Taylor half pint soda - the most of one we had recovered yet - broken off just above the shoulder. I set the piece aside, and continued to dig. 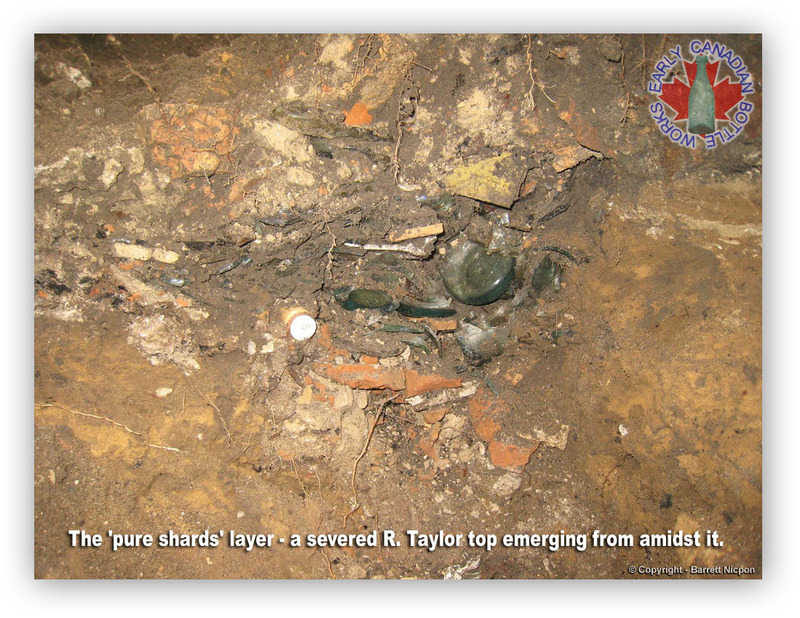 Large Taylor and Murdock quart sized chunks, as well as the occasional pint R. Taylor shard emerged, including one or two R. Taylor pints with just the tops knocked off. The spot where Kyle had removed the ginger beer the day before was still plainly visible, but digging in that direction was nearly impossible due to the undermining situation. At this point, we were digging right underneath where the thick hedge running alongside the back yard was located. I attempted to clear away some of the dirt at the roots of the hedge, but instead of progress in digging that direction, all I was rewarded with was my first ever intact Pilgrim Bros bottle out of Hamilton - this one a clear, base-embossed pint crown top piece. Ultimately, I gave up on digging in the direction of the hedge, and worked my way away from the house, alongside the 1950s-bottle-filled cistern Kyle had found previously. Kyle arrived after another half an hour of digging nothing but shards, and brought unusual news. "Your dad is here!" he exclaimed excitedly. I was confused, as my father had no real interest in digging bottles previously, he was a man of interest purely in insulators - why he would show up at a bottle dig with no probability of finding insulators whatsoever? I wasn't about to complain, though, and greeted him. He said he had nothing better to do, and had decided to stop by to see this place and what it was all about. My mother had tried for years to get my father to collect anything, bottles included, and I had succeeded in piquing his interest in not one, but two collectibles (bottles and insulators) without investing any real effort! I continued to dig in the large hole I had opened, away from the house, while my father & Kyle set to work on the opposite side of the hedge, in between the soda works, and its neighbour. Around the time I began to notice an unusual concentration of shards in the hole I was working on, my dad and Kyle both announced they appeared to have something intact. My father, working on his base, concluded that it was in fact broken, but it was a substantial shard from a G. E. Murdock quart, and any one of us could have mistaken it as intact. Kyle, however, continued to work on his quart crown top soda. A chip removing part of the upper ring of the crown top was visible, but that was it. Kyle remained silent from where I could hear, until suddenly he announced that he had found an intact J. Tune quart crown top soda from London - the same as the one Jim had found in the basement, except this piece was an unusual greenish aqua colour - very similar to many European-made bottles from the era. We were all excited at the prospects of intact bottles emerging from this area, especially having found Kyle's R. Taylor ginger beer with just the top knocked off the day before. I continued to eagerly shovel dirt onto the end of my shovel, as I prefer to not have tailing from the sides of the hole backfill where I am trying to watch for shards, and from off to the left where I had nearly given up digging, I pulled a shovel full of loose, orangey-coloured dirt with the outline of a half-pint split soda. Grabbing the bottle, and examining it, my heart skipped a beat in reading "R. TAYLOR / TRADE MARK / STRATHROY" in bold, clear embossing, from around that tell-tale artistry of a horse jumping through a horseshoe that makes R. Taylor so famous. Examining the piece, all I can find wrong with it is a lip chip removing half of the upper ring of its crown top. The best example we had recovered yet, even better than that from earlier in the day! I showed my Dad and Kyle, who fondled the piece and made note of the incredible prospects for more intact bottles. Around this time, Jim showed up, and joined in the digging on the far side of the hedge. After removing several shovelfuls of dirt from the hole, I continued to dig away from the house, and to notice the sheer concentration of shards, as well as the unusual depth to which the pieces ran. There was quite literally no dirt in some areas - just 6 to 10 inches of bottles shards stacked on top of one another. 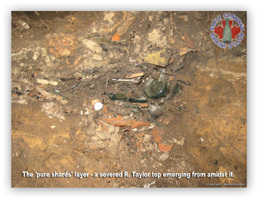 It was difficult digging, and it required leverage from below the vein, usually in the virgin clay layer, to remove such a number of shards. Jim reported that he was encountering the same layer where he was digging, but at a shallower depth, and directly beside and beneath the sidewalk running along the neighbour's house. Kyle began to dig towards the sidewalk in an effort to locate the same vein, and also encountered the shards. Meanwhile, my father had located a hutch soda base in his hole, and we all agreed that it appeared to be intact. As he worked on the piece with the trowel he had brought, more and more slowly came into view, until he was able to pry it loose... only to find its top knocked off. However, the bottle was an unusual find, being probably the farthest from home of any of the shards we had found. "TOSSEL & SON / NIAGARA FALLS, ONT" it read in bold, 1880s embossing, and it still had the gravitating stopper tucked into the neck. After pulling that piece out, he decided all the traffic in that short stretch of path, about 8' long, where Kyle, him and Jim were all digging, had become too congested, and had moved farther down the path, to beside the approximate middle of the soda works house, and had begun digging. He reported to us finding more glass shards, though nothing in the sort of concentration we had been finding. I continued to dig (or try to, anyways) the deep pocket of pure shards, and through gentle leverage of the soil beneath the vein, sent a land slide of pure shards, there being no dirt present to hold them together, into the hole. My heart began pounding, as this slide had revealed both a top, and a bottom, of two separate bottles, peering out from the shards, and both appeared to be more-or-less intact (though the top was a crown, and had visible chipping around the lip). 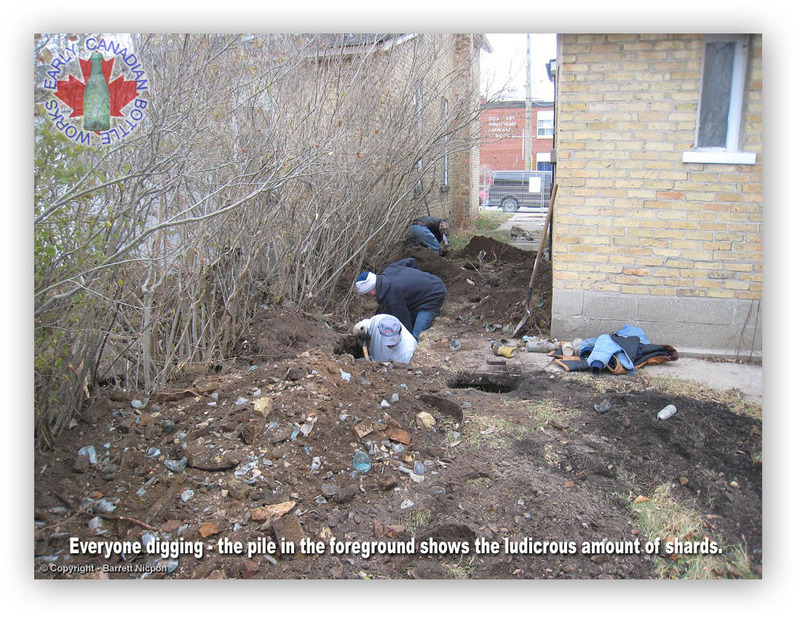 I levered a few more shovelfuls of shards from the vein, and then knelt into the hole to retrieve them. The base that was visible protruded father than the top, so I went for it first. Out of the ground slid a hutch soda, with the stopper still inside. "M & K / WINDSOR / ONT" read the green-aqua coloured glass, and examining the piece, I was unable to find any damage whatsoever. I excitedly showed Kyle only the second intact and close to mint condition hutch soda to emerge from the entire 5 days of digging thus far, and an Ontario piece none the less! I said I had another piece showing, and, placing the hutch beside the other bottles found so far, I knelt again to retrieve the top. Gently sliding the bottle from its glassy grave, I was pleased to see it emerge complete, even if a large portion of the top ring on the lip was missing, but when I spotted the embossing, I knew this discovery was something important. " G.E.MURDOCK / STRATHROY" was all it said, embossing in an oval slug plate on the front, and with no emblem. 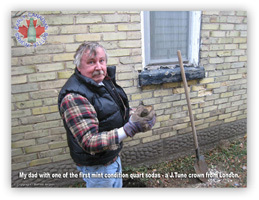 It turns out, this crown top pint soda is the most intact example known to exist by any of the diggers in our circle, with Jim Butler in possession of the only other known example - it being cracked in half at the shoulder and re-glued. I was so excited by the find that I had to sit and gaze at it for a moment before resuming the dig. Shortly after my pair of successive finds, Kyle had worked right up to the edge of the sidewalk, and was just about to begin digging beneath it, when he decided to clear some of the metal scrap out of the hole, in an effort to make it easier to dig. 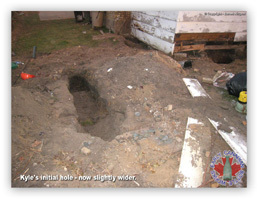 A large barrel rung jutted into the side of his hole from beneath the sidewalk's edge - only about one third of it visible. He announced that he had a good feeling about whatever lay behind this barrel rung, and began to tug. I am sad to report that I wasn't standing above ground level when it happened, but I'm sure if you ask either Jim, my father, or Kyle, any one of them would tell you it happened in slow motion. As Kyle pulled the barrel rung from the dirt out slid countless glass shards, along with a completely, 100% intact, J. TUNE & SON ginger beer bottle. This one was even complete with the original stopper and metal clasps still attached! Kyle grabbed the bottle and began to gasp and sigh and grunt with the sheer excitement of having dug his first ever intact ginger beer... and with the number of broken examples around, it appeared he wouldn't have the chance to pull any more out in such grand condition. The only damage to the piece appeared to be a pair of calcified cracks, one in the front, and one in the back, but easily bleached out a bit with some acid soaking. 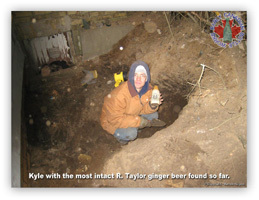 Shortly after, Kyle also emerged from this very hole with an R. Taylor seltzer bottle with just the top knocked off. As of now, each one of us had an almost intact example of this lovely Strathroy seltzer (though Jim already owned an impressive selection of local seltzers). All the while, my father had continued to dig, right through the adverse conditions known to bottle collectors as "finding only broke stuff". And then, quite suddenly, a bottle edge was poking into his hole. "I think I've got something intact!" he called to us, and Kyle ran over to investigate. Sure enough, Kyle verified, he appeared to have another quart soda emerging into daylight for the first time in nearly a century. He continued to excavate the bottle until he was able to gently tug it free. I was able to climb out of my hole, grab the camera, and take a photo just as he first removed the bottle. Another "J. TUNE & SON" crown top quart soda was liberated, and soon to be added to someone's collection. 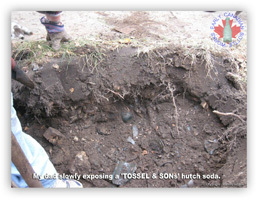 We were all impressed that my dad had found an intact bottle in such adverse conditions, especially on his first real dig... so imagine our surprise when, within a minute, he reported yet another intact bottle had appeared in his hole. Kyle verified again, and, this time, I didn't bother to go check it out, as I was too busy concentrating on the deep vein again. Once again, my father emerged from the hole holding another intact J. TUNE & SON quart crown top soda out of London - these two must have been within inches of each other. Perhaps a sign of things to come, we all hoped. We continued to hope, and when my father indicated a third bottle appeared to be intact, we were in sheer disbelief! So few bottles had emerged the entire time intact, and my dad, on his first dig, had found almost as many in one dig, as we had all collectively found in 4 others! However, when he pulled this third example from the ground, he was saddened to report that this one had the top knocked off like so many of the other bottles we had found also did. 2 other quart J. Tunes also emerged with their tops knocked off from my father's excavating, before I decided to go over and join him. Jim & I had tunnelled into each other, as a land bridge of hedge roots had formed between the two holes. I had stopped finding anything but lots of shards, including more from R. Taylor and Farr & Sharpe ginger beers, and decided to go see where else some work could be done. Kyle & Jim were only finding shards at this point, so I decided to go help my dad out, as did Kyle. I opened up a hole slightly closer to the front of the house, and Kyle opened one right near its front. Shortly after beginning this hole, I realized that I had to leave to pick up my girlfriend from work. Naturally, I pushed the time limit to its maximum, watched my father pull out a dark olive green European soda bottle with no embossing, and an R. Taylor quart with the top knocked off, and then had to go. Apparently, as the story goes, after I left little else came out of the ground... except one important piece! 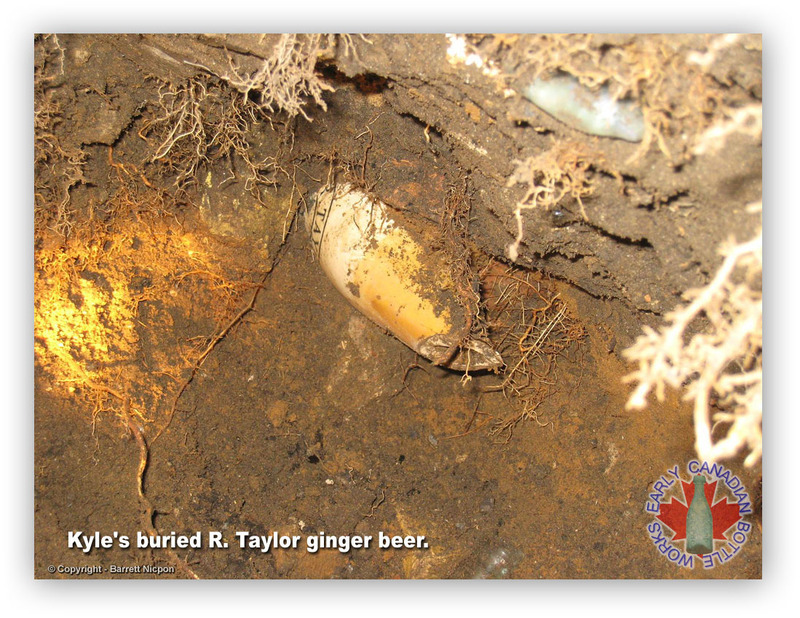 Jim had uncovered yet another R. Taylor ginger beer, with just the top knocked off, while digging in the pure shards layer next to the sidewalk. Now each of us had one example with just the very top knocked off - mine from the basement, Kyle's from the hole next to the rear addition, and Jim's from in between the buildings, plus the example Kyle had found in two large pieces with the top knocked off, in the backyard. Perhaps more could be pulled out? Our spirits remained high, and Kyle, Jim, & my dad all departed not too long after I did. Everyone agreed to meet up again the next morning for a third consecutive day of digging. Perhaps tomorrow would reveal a couple more quality pieces!